Join Tantra on a yoga teacher training for men and women in Cusco, Peru! This course provides you with the opportunity to learn how to teach Tantra and Tantric Hatha yoga with Vinyasa, Pranayama, and meditation. Also, you will be able to deepen your practice of yoga by participating in the ancient philosophy of Kashmir Shaivaism, the path of expanded consciousness liberation and the ancient Tantric roots of Hatha yoga included in classic Hatha yoga scriptures. You will stay in the beautiful accommodations with breathtaking views provided by Tantra. Upon successful completion of this yoga teacher training, you are eligible to register with Yoga Alliance. This teacher training course invites students to experience the practice of Tantra yoga through manipulating energy and consciousness. The main style of yoga taught is Hatha with Tantric Vinyasa. This combines smooth flowing movements with the traditional stillness and alignment of Hatha yoga. The Tantric practices also hold asanas for longer periods to experience a deeper energetic activation and the opening of the body to expanded experiences of awareness and superior consciousness spheres. During the course, you will be taught theory and practices from the traditional Kashmir Shaivaism Tantric practices of India. These teachings are taught in a devotional way to combine the science of Tantra with the path of the heart. The course is a sacred journey into the ancient arts of Tantra. The course has a deep focus on learning Prana Vidya, the ancient science of manipulation of prana, knowledge not easily available nowadays. During the training, you will also study Tantric cleansing Kriyas to purify the mind and deepen your ability to be centered and present in life. Tantric profound Mindfulness meditation will give you a personal opportunity to open the energy of the full body. An important practice is the esoteric feminine form of Tandava, the dance of Shiva. The theory elements cover many topics always including Tantric and yogic philosophy and ancient scriptures such as Vijnana Bhairava Tantra, Yoga Spandakarika, Hatha Yoga Pradipika, and Shiva Samitha. An introduction to Yoni Tantra studying anatomy and sacred sexuality is also covered. Each day, you will begin at 06:00 with Tantric meditations and a yoga class, followed by fresh organic vegetarian breakfast. After breakfast, you will explore the principles and philosophy of Kashmir Shaivism, Hatha yoga, and meditations of the Tantras. Also, you will study how to integrate the Tantric principles in the yoga practice, with the style of yoga the student likes, which is Ashtanga, Vinyasa, Iyengar, etc. Shivaism is a hermetic practice where only the practitioner knows he is using the Tantric principles of the tradition. After lunch, you will continue exploring different Tantra meditations and going in the deep path of Tandava, the dance of Shiva. Tandava and other Tantric meditations need several days of immersion to connect with the essence of the practice. After a break in the afternoon, you will practice other meditations and a light yoga class. The regular schedule will end around 20:00. 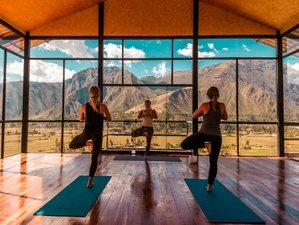 This yoga teacher training will take place in Cusco, Peru.